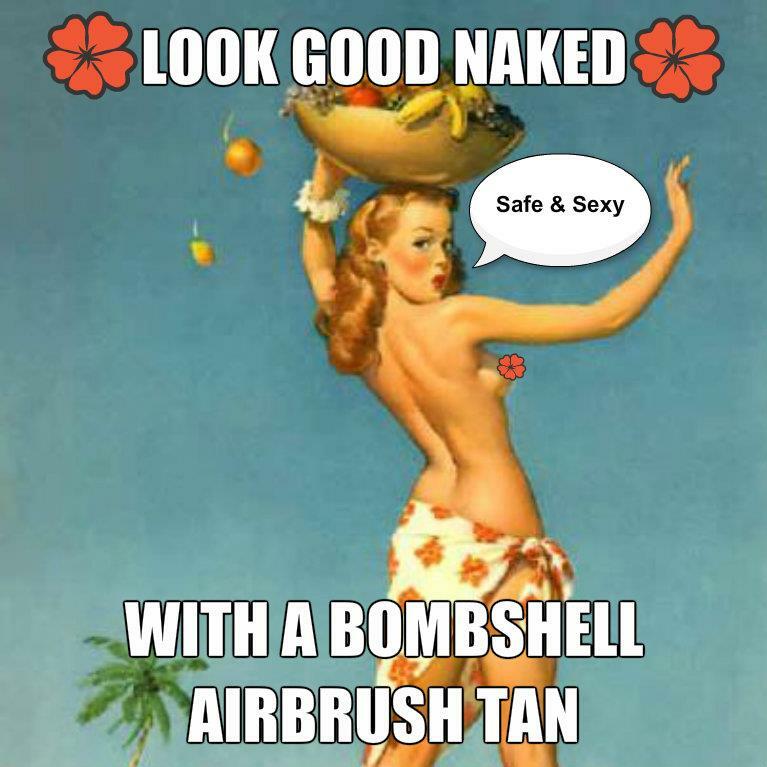 Airbrush Tanning to the Rescue with the Help of Bombshell! Winter can be great fun, between getting all bundled up and sitting next to a fire and playing in what little snow falls on the ground. But winter does have a downside. Our skin often starts to take on an uneven tone, or lose its beautiful summer tan altogether, as it takes a special kind of kitten to sunbath in 30 degree weather! Now that springtime is almost here, it’s time to start breaking out your saucy, revealing summer wardrobe. Before that happens, get a head start on your summertime glow with the perfect airbrush tan. A well done airbrush tan can last up to 7 days if you follow these tips. First, exfoliate your skin before the airbrushing. Keep away from lotion for now, and remember to tackle your elbows, knees, and ankles. Dress in loose, flowing clothing after getting your airbrushing done and stay away from jeans, silk, and polyester as they will rub off the DHA and bronzer. The airbrushing takes about 20 minutes and takes 8 hours to set, so plan accordingly. After your appointment, try your best not to sweat by planning to stay in a cool place. No airbrushing right before your hot date, or your tan will not set! Any water on your skin will stop the DHA process, so stay out of the rain and the pool. Be sure to sit on a towel anytime you lounge on a sofa or leather seat. Once it’s time, jump into the shower, but just rinse off, don’t scrub, as abrasives will ruin your tan. The bronzer on your body will wash off, but don’t worry, the bronzer is there to help our technicians see where they airbrushed. Blot or dab yourself dry–don’t rub. Now you may use your lotion and enjoy your new tan. Break out your revealing clothing without worrying about pasty skin or uneven tan lines!